Click here to see the full size comic strip. This is based on an actual post I saw online this weekend. BALLPOINT ADVENTURES CLASSIC from 3/15/99: Billy REALLY Thinks Barbie Shouldn't Smoke! I don't remember exactly what was going through my mind when I drew this, but I'm sure it was all about ironic irony. BALLPOINT ADVENTURES for June 22, 2015: Billy is Fed Up with Smartwatches! This is based on a true story! BALLPOINT ADVENTURES CLASSIC from 3/8/99: Billy and Barbie Travel Thru Time! I always hate it when people point out how "We're all time travelers! We're all traveling to the future! One minute at a time!" BALLPOINT ADVENTURES for 6/15/15: Billy and Barbie Remember the 1990s! Click here to see the full-size strip. BALLPOINT ADVENTURES CLASSIC from 3/1/99: Billy Impresses Barbie with his TIME MACHINE! BALLPOINT ADVENTURES for 6/8/15: The Truth About the Republicans Running for President in 2016! I hope Hillary exploits this to the Nth degree. 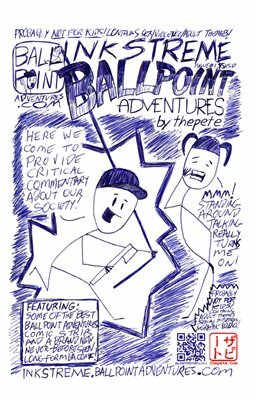 BALLPOINT ADVENTURES CLASSIC from 2/22/99: Billy Does Something About the Crap on TV! Happily, TV has gotten a little better since 1999. It does feel like there's a LOT more pressure on us to be patriotic with an "act" like this on the books, doesn't it? I mean, it's like we hate America if we don't like this thing that actually abridges our freedoms.